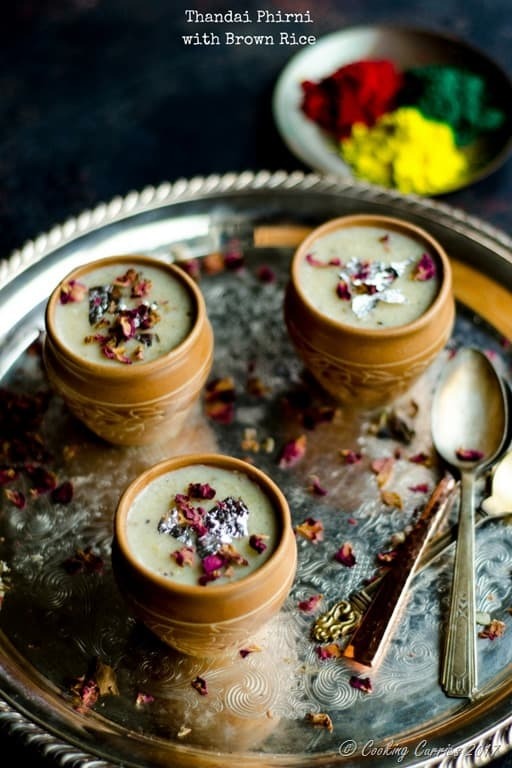 A delicious rice pudding delicately spiced with Thandai Masala to create a special treat for this Holi. 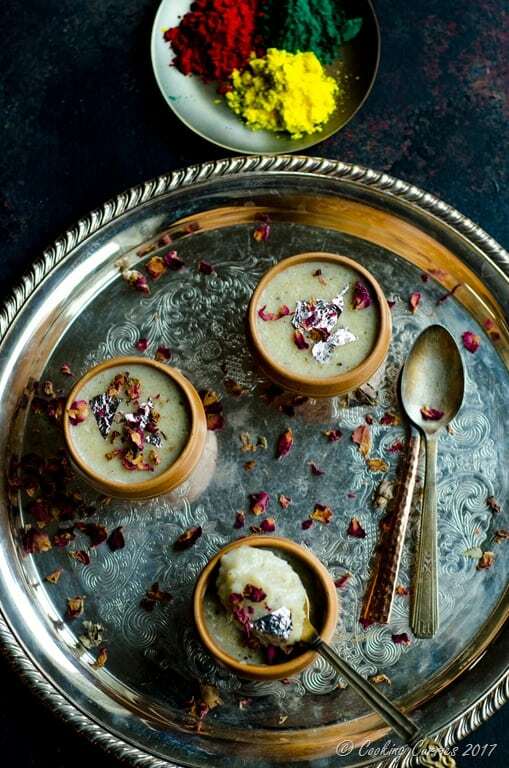 And the bonus is that this phirni is made with brown basmati rice! Holi is almost here with promises of spring. Only, my weather app still shows lots of rainy cold days ahead. Well, at least in theory Spring is here soon. Holi is the festival of colors that is celebrated in the Northern parts of India to welcome Spring / Summer. Well, we don’t really have a real spring season in India, we just spring into summer straight from winter, so basically its to celebrate the end of Winter. 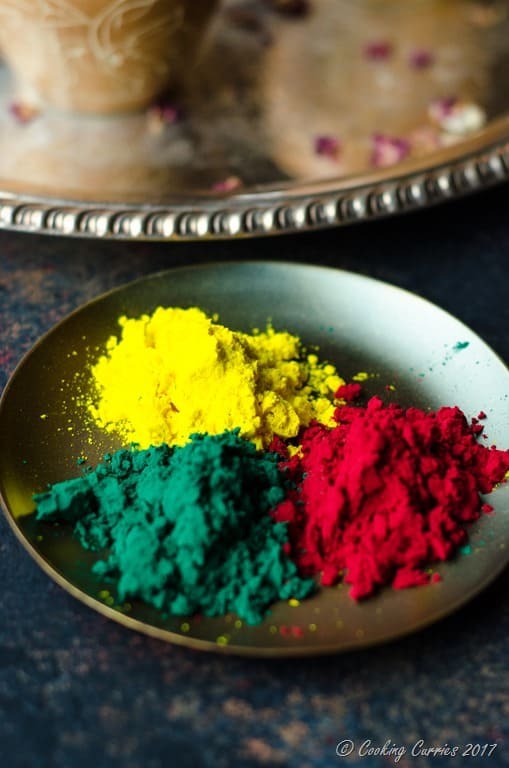 When you think of food for Holi, the two things that come to your mind first are Gujjiyas and Thandai. Gujjiyas are flaky fried pastries that are filled with all kinds of sweet goodies like nuts, coconut, sugar and what not! 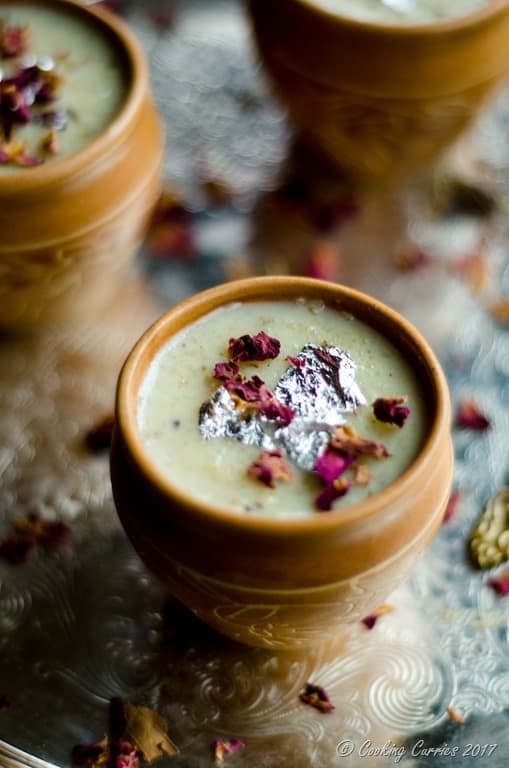 Thandai is a spiced milk, that is made with a blend of nuts and spices mixed in with milk, strained and chilled. I bet the chilled milk is perfect after playing with all the holi colors out in the sun! Well, here in Seattle, we might need a hot cup of chai instead. 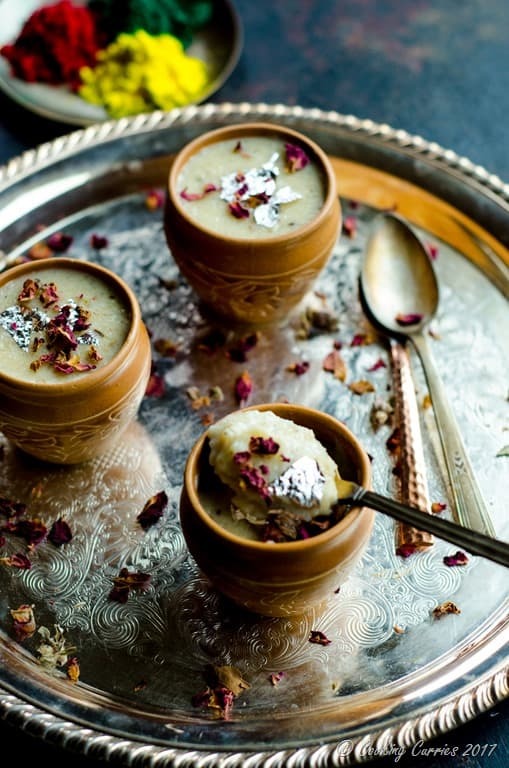 Phirni is a rice pudding, a cousin of the kheer / payasam that you more commonly find in the Southern parts of India. Phirni is made with broken rice and milk, where as the regular kheer / payasam is made with just rice and milk. 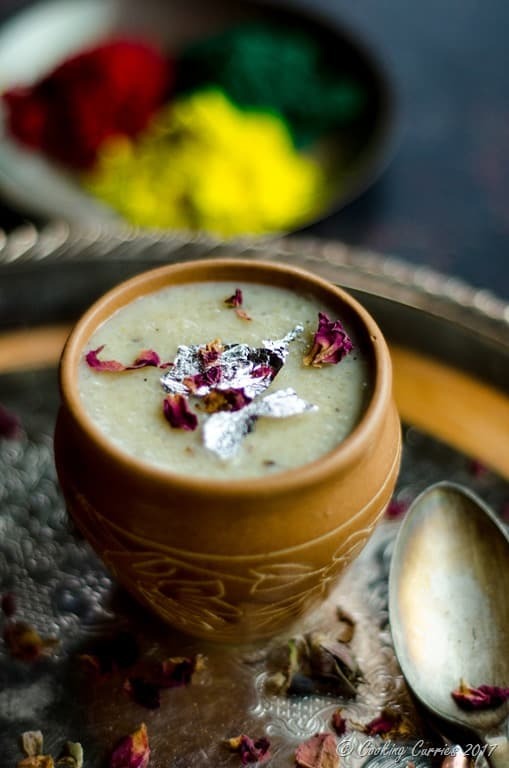 I love a good rice pudding, so to celebrate Holi my way, I combined the best part of Holi – the Thandai masala with my favorite kheer to make this Thandai Phirni. I also used Brown Basmati Rice instead of the regular white one that is used normally. Since it is soaked in water for a while and ground to a coarse paste, the cooking time does not increase a whole lot than when you use regular rice. What is your plan for this holi? Are you gonna go out to play with holi colors or just have a party at home later? What all are you gonna make? I know I am definitely making this again. Wash the brown basmati rice and soak it in water for about 20 mins. Soak the almonds in water for 20 mins. Bring the milk to a boil, reduce the heat and keep it simmering. Drain the soaked rice and grind it very coarsely in a food processor. Add it to the milk and let it cook. Now, remove the skin from the almonds by gently sliding it off. Remove the seeds from the cardamom pods. Add the almonds, cardamom seeds and the rest of the ingredients for the Thandai masala, except saffron, to a food processor and grind to a coarse mix. Add this to the simmering milk and rice mix. Add the saffron too. Mix well. Remove from heat and chill in the refrigerator. Pour into serving bowls and top with edible silver flakes and drier roses before serving. Now, remove the skin from the almonds by gently sliding it off. Remove the seeds from the cardamom pods.Add the almonds, cardamom seeds and the rest of the ingredients for the Thandai masala, except saffron, to a food processor and grind to a coarse mix. Gorgeous photos! This looks yummy! Such a beautiful dessert! I love the rose and silver on top and the use of brown basmati rice. Those spices have amazing color! Gorgeous recipe! What a beautiful photo and I love little portions of anything! Those little pots are so cute! I love rice pudding and this is sooooo different from anything I have tried so going on my to make list.